Maia Sharp is a singer/songwriter of extraordinary talent and promise. The reviews of her CD "Hardly Glamour" started coming out in April 1997, and by July, The Album Network, CMJ New Music Report, Rock Love Magazine, Songwriter's Monthly, and a host of regional papers had declared that here is somebody to make us pause. Songrwriter's Monthly adds," We wanted to be one of the first to let you know that there's an incredible talent out there who is deservedly striking out on her own." This 24-year-old pianist, oboist, guitarist and saxophonist may find that songwriting is the most remarkable expression of her musical gifts to date. Her debut "Hardly Glamour" had been written and recorded before she started seriously seeking label interest. This allowed her complete artistic freedom--no time constraints, no creative limitations, and little concern for current trends. Just after the record's completion, Maia caught the eye of Miles Copeland and Art 21 Records who immediately recognized this as a work of pure expression and a collection of songs that can go the distance. The opening cut and first single, "I Need This to Be Love," weaves a movie in the listener's head as it tells a story of desperation and strength through classic yet conversational lyrics. "My cowriter, Mark Addison, suggested we write a Thelma and Louise type song," Maia recalls. We tried to key into the outlaw factor and the scenic landscapes and wrap it all up in a metaphor about what we put up with for a chance at true love." Most likely to be the second single, "Brownstone" highlights Maia's Production skills using exotic percussion, bowed bass, a soprano saxophone duet and a scattering of unidentifiable sounds to help tell a story of survival and selfcommitment. The final cut, "Parting Request," which Maia performs with just a piano, simultaneously tells of life lost and love rediscovered. "To me, the lyrics are what make a song great," Maia explains. "When I've finished a song, I alway ask myself, could I hand these words over to someone just on their own on a piece of paper and feel proud? If the answer is no, then it's back to the drawing board." These standards have given Maia an album with no misses. As her career dawns, her reputation as a writer has grown quickly. In the past few years, established performers and writers such as Carole King, Jules Shear, Gary Burr, Alannah Myles and Paul Carrack have all chose to write with Maia. 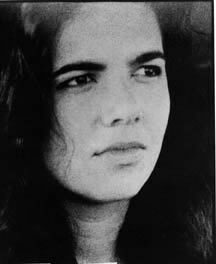 Maia cites Joni Mitchell, Ricki Lee Jones, and her father, Randy Sharp, who coproduced "Hardly Glamour" with Maia, and whose home studio made it all possible, as major influences. "My dad, who has had a successful career as a professional songwriter all my life, showed me by example that writing was a tough but very rewarding way to make a living. So, he couldn't exactly tell me to go out and get a real job." She adds, "I'm learning as I go here. I don't know what will be expected of me at any given turn, but I am confident that the music will always speak for itself." The Night Eagle Cafe is hosting Maia through one of those wonderful, serpendipitous situations that life sometimes throws at you. She is currently opening for Janis Ian, but several free days in the schedule have her in our area. The short notice booking by her management was unexpected, but a very welcome surprise.